Those of Christian faith persuasion commonly express dissatisfaction with contemporary art. Why is it so difficult to understand? What is it suppose to represent? What does it mean? These and other questions result in many taking leave of contemporary art and settling for the comforts of more traditional and familiar works. In his recent book Daniel Siedell provides an invitation to Christians who have stepped away from modern art to give it another look. 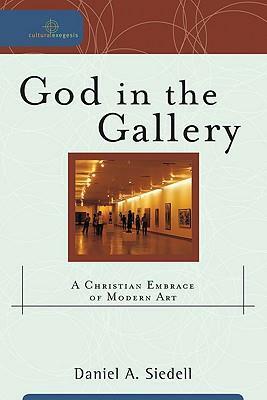 God in the Gallery: A Christian Embrace of Modern Art offers a sustained case for serious engagement with modern art by those who walk the Christian path. The author writes not as a theologian or philosopher but as an experienced curator and now a professor of modern and contemporary art history and criticism. His argument begins by invoking the example of Paul in Athens engaging the philosophers on Mars Hill. Paul’s tack was to use the artifacts present in the culture – altar and poetry – and “in a radical move bent them toward the gospel”. Siedell is an advocate for an understanding of art that focuses on contemplation. This is only one of many ways that art functions in our cultural setting. He takes up the subject of icons in the Eastern Church and explores their potential as a resource for fresh understanding of contemporary art. He calls us to harken back to ancient and medieval sources to discern a countervoice to modernity. Clearly Siedell sees in all art, whether explicit or implicit, spiritual sensibilities and aspirations which are commonly shaped by the cultural presence of the Christian faith. These themes may be discerned he argues, despite counter claims by artists who would eschew the spiritual or religious nature of their work. He devotes one chapter to recount his own journey of discovery in the work of artist Enrique Martinez Celaya. The final chapter of the book serves as a coda – where the author takes up the vexed issue of Christian art and Christian artist. He articulates some key difference with the two important figures whose work has served to shape much Christian conversation about art, Hans Rookmaaker and Francis Schaeffer. He points to weaknesses in their approach but is more interested to highlight his alternative paradigm than to engage in warfare over specific differences. This is an important book for anyone interested in the subject of faith and contemporary art. Siedell is a new voice and he brings rich experience and fresh insight to the topic. This work is likely to become a reference point for all future conversations about Christianity and contemporary art.